Before all that sloppy snow fell yesterday, I spent some time on Friday refining a drainage path in the paddock. 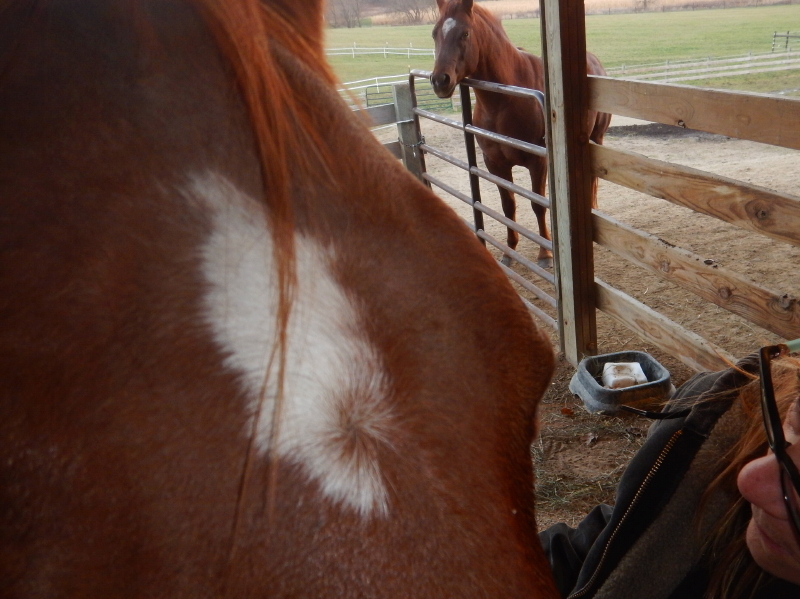 The horses took immediate interest, more so because I was working near a gate they hoped I would open. I had no intention of giving them access to graze in the arena at the time, but they eventually charmed me into allowing it. Unfortunately, Cayenne violated my trust and stepped through the web fence out there and spoiled it for everyone. I had to stop what I was doing to go into the barn for a halter and then march out after her in order to walk her back into the paddock. I was not happy about the interruption. We have not had much luck keeping a path open to drain that side of the paddock because the perpetually wet soil there is constantly disrupted by hoof prints in the mud. I’m trying to create a wider swale with a lip on each side, knowing that it will still require repeated maintenance to prevent hoof traffic from plugging it up. In the long run, I’m hoping to shape the lay of the land enough that their normal activity doesn’t interfere with the way it drains. Water will always flow down the easiest route available. Meanwhile, I’m wondering if the initiative shown by Cayenne to venture astray on Friday has any relation to the behavior I noticed yesterday under the overhang. Is she taking on a leadership role in the 3-horse herd? Look how they lined up behind her to wait until she was done eating. Gives the impression she is the one in charge. Time will tell whether this settles into a new normal among the three of them. 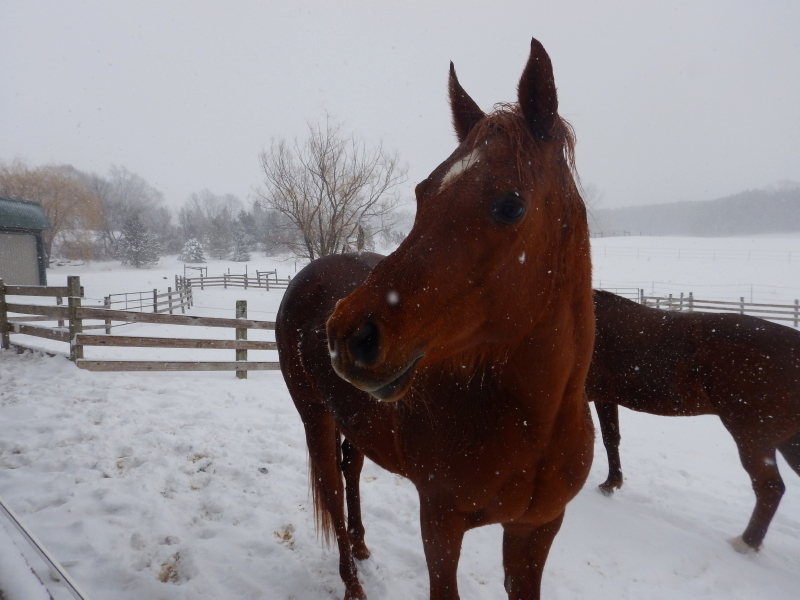 Our horses seemed about as pleased with the monumental April weekend of snow as we were. Despite the weeks of being confined to stalls at the beginning of the year, the relentless onslaught of blowing snow had them eager to get back indoors again. In the picture above, you can see that Cayenne seems to have stepped up to the front position, which hints at her moving into the leadership void that was left by Legacy’s departure. We’ve noticed several instances lately where this new hierarchy appears to be normalizing. Dezirea, the senior mare, looks to be comfortable maintaining her usual position as the assistant manager, overseeing things from the back of the line. There was a fair amount of urgency in their attitudes when it came time to bring them in each afternoon. Once inside, out of the wind and wet, the horses calmed significantly. In the mornings, they willingly step out again for some fresh air, but after a few hours in the storm, they start to look for signs we are preparing to bring them back in. When we didn’t get to it as quickly as they wished on Sunday when the snow was falling fast and furious, we started to hear a fair amount of vocalizations from them, expressing rather clearly that they felt they had endured enough of the harsh conditions. 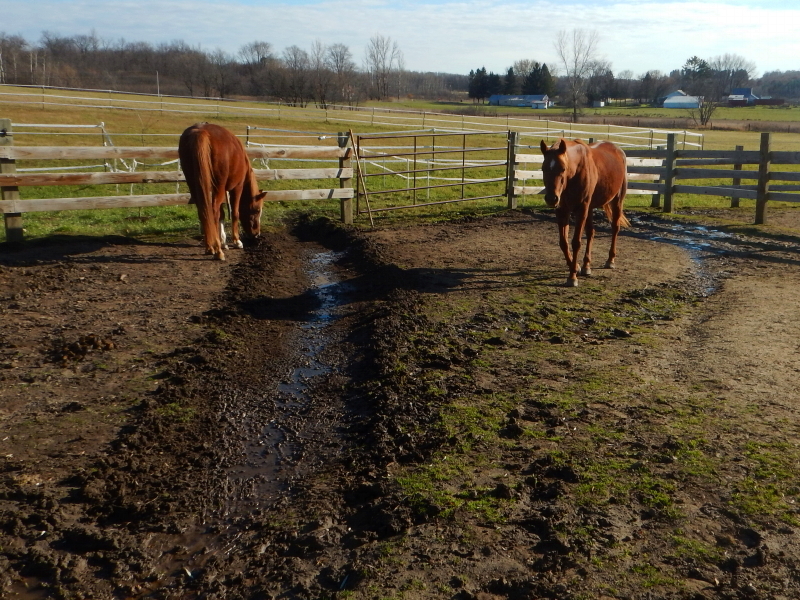 It’s going to be a muddy mess out in the paddocks for a while now, but I think the arrival of some sunshine today, and again later in the week, will go a long way toward soothing their recent frustrations. As it will for us all, I’m sure. I can’t wait for April weather to actually get here for real. As for this “Apruary,” we’ve had enough. Not that we want to compound the misery we put our horses through, but the weeks of indoor confinement they just endured have come with the added insult of decreased rations. If protecting them from the ravages of founder (laminitis) means we need to closely control what our horses are consuming, we need to do it regardless of how unhappy they act over the situation. I am certain that the reason Cayenne was prancing around snorting when I freed her from the confines of her stall on Saturday was because she had grown so agitated over the lack of anything to eat in her “cell.” She had made that clear with the kicking of the wall and pawing at the floor when I showed up to greet the farrier and get Hunter some padded shoes. The precisely measured portions I had meted out at noon were ancient history and she wanted more. 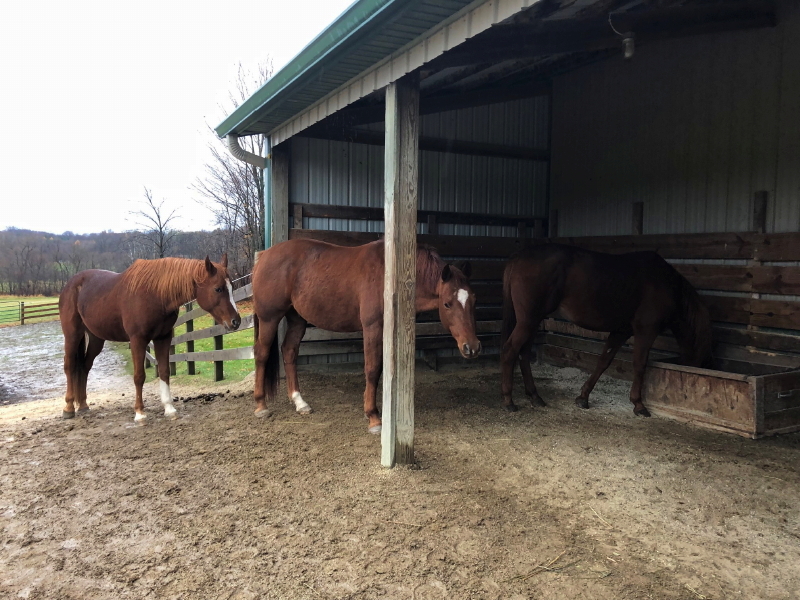 Luckily, she settled down a little bit while Hunter was brought out of his stall to stand between both mares and be fitted. Later, after the three horses were done thrashing around outside in the paddock, they settled down and took up stations over the hay boxes, where bonus servings had been made available to augment their celebration over the return to the great outdoors. Now, even though it was a bonus offering, it was still a precisely measured meager portion of a bonus. 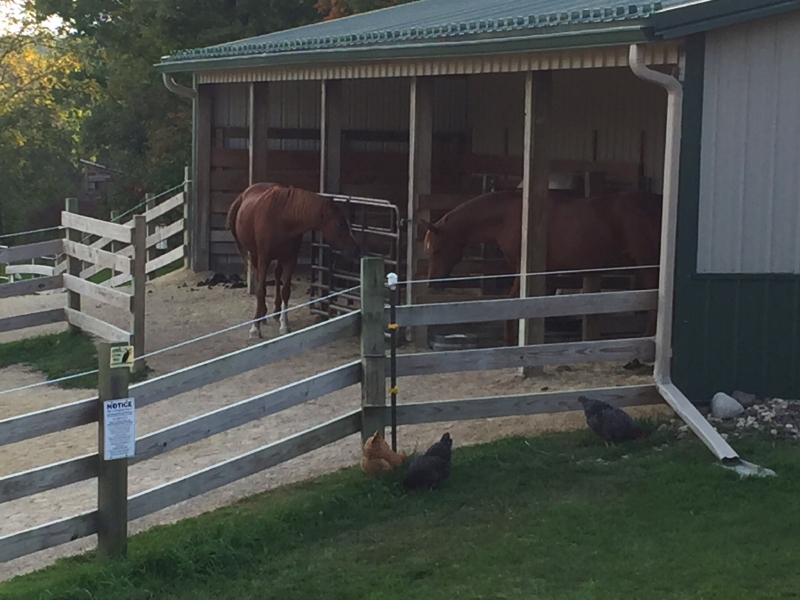 It didn’t take them long to show their feelings about the restrictions of this new diet still being in place, even though they have been released from confinement in the barn. Yesterday, I spotted them grazing on the winter manure pile inside their fence line. 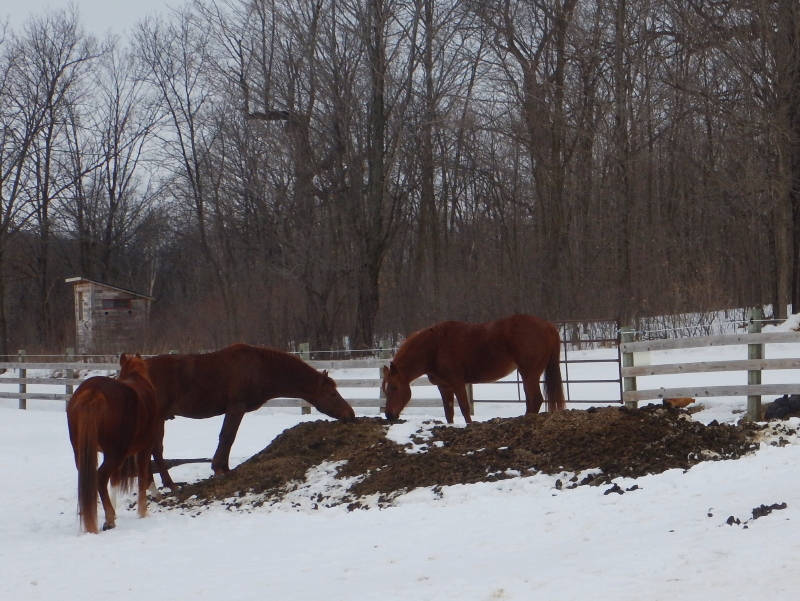 It seems there have been a few morsels of hay raked up with the manure. Cyndie fretted the other day that feeding our animals (and I might add, her family and guests) is one of the ways she shows her love. For the record, she loves me a LOT. It breaks her heart to see the horses stoop to digging through the manure pile for blades of grass. I’m sure it’s not the first time a restrictive diet has brought on behaviors for which pride gets tossed aside. In reality, they aren’t really that desperate. They were just checking out the pile for a brief few seconds. I thought it looked funny and snapped the photo. It makes for good story! The diet is for real, and their adjustment to it is going to take some time, but we are optimistic a new balance will emerge and we will be back on a path to optimal health, soon. Soon, in a relative sense of the word. 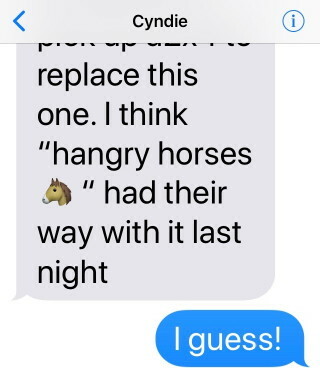 Cyndie had me laughing on Friday with a message that Hunter and Cayenne had busted one of the 2×8 boards on the shared wall of their stalls. 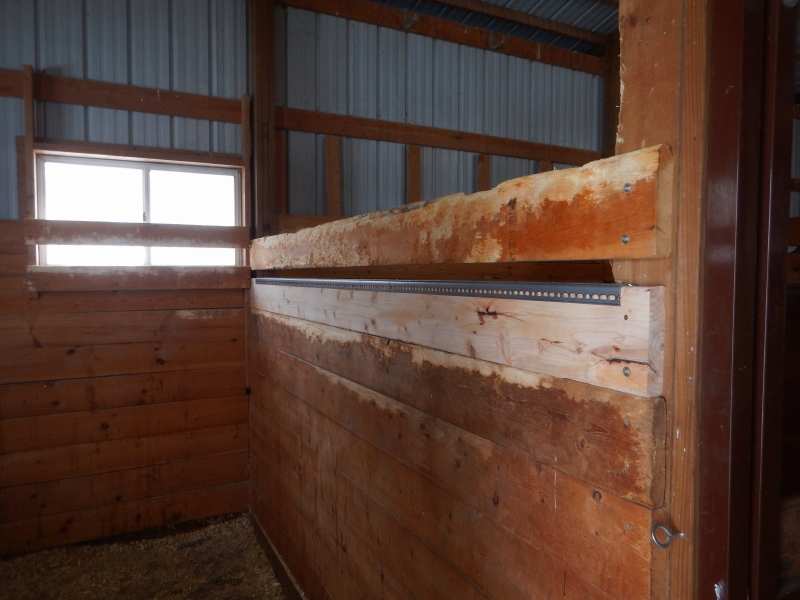 We have had pretty good luck with minimizing the gnawing of boards on our fences and the stalls in the barn over the first four years with our horses, but in this latest stint of their being forced indoors day after day, while also getting precisely measured reduced rations of hay, the wood is finally taking quite a (b)eating. Although it has seemed like Hunter was doing the most damage in recent days, Cayenne is not an innocent bystander. She has some history from a couple of years ago, when that board came off when Legacy was in the stall next to her. 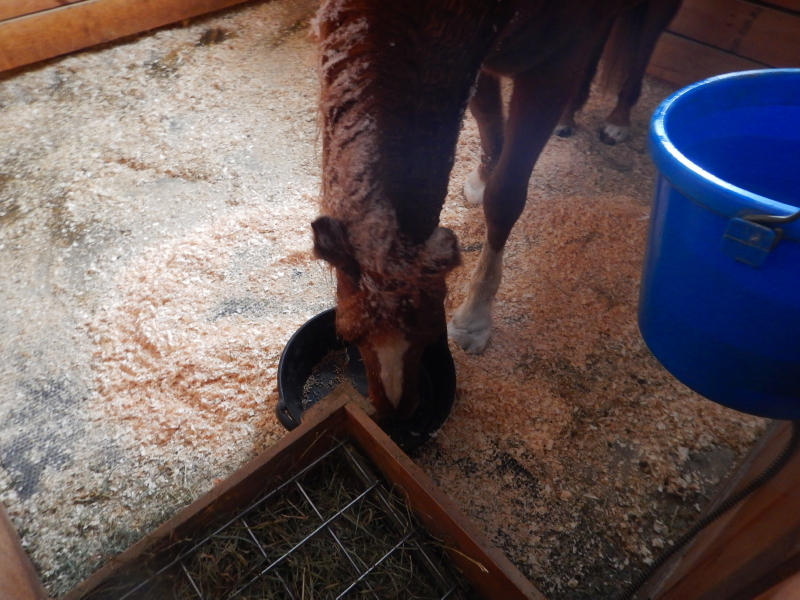 There wasn’t a lot of chewing going on, so we surmised she had simply pushed it off into Legacy’s stall. Back then, I was able to reuse the board and put it back up, securing it with longer screws. This time, they had done enough damage that I needed to get a whole new board. We decided to add a metal edge to discourage a repeat performance. The tightly controlled diet they’re on is probably going to last for a long time, if not forever, so “hangry” is something we will need to help them resolve. It’s been a blissful treat watching them graze our pastures in years past, but the accumulating results of that luxury has not been healthy for them. Wild horses that need to cover a lot of ground to search out food and water while also moving around to manage herd safety, expend a lot more energy than our fenced herd. Our three don’t get enough exercise to offset the abundant and lush grass that grows in our fields. They are going to need to get used to living on much smaller portions from here on out. More immediately, I’m just looking forward to Hunter getting free of the hoof pain and being able to stay out of the barn for everything but the worst weather. From the “hangry” wood chewing we are seeing, I’m confident in saying he is looking forward to it even more than me. I was simply killing some time while waiting for a delivery after I got home from work. Strolling down the driveway from the house toward the barn, I decided to go see the horses. I found all four of them fully engaged in grazing from the freshly filled hay boxes. Not wanting to bother them, since I really had no agenda, I scaled the fence and walked past them to go kick around one of my several landscape projects in the large paddock. Minutes later, Cayenne appeared out of nowhere. Unhesitatingly, she closed the gap and came face to face with me. It was impossible to miss the extreme swelling in her left eye. She was obviously seeking help. I phoned Cyndie in the house to alert her and comforted Cayenne as much as I could. She seemed to appreciate being scratched around the area of swelling. If there is such a thing as referred pain, I figure it’s possible there can be referred relief, as well. 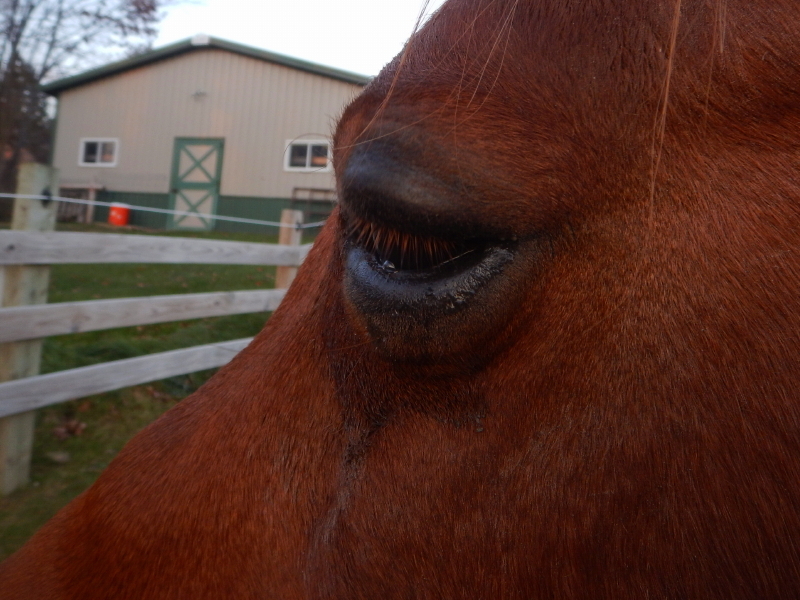 Cyndie arrived with a saline rinse and we moved Cayenne under the overhang to look after that eye. Hunter and Legacy seemed genuinely concerned for their ailing herd-mate and leaned over the fence to observe. Cayenne was surprisingly cooperative with Cyndie’s effort to rinse, inspect, and clean the swollen eye. When the drops were applied, Cayenne actually turned her head in the optimum angle to accommodate the rinse, and blinked repeatedly to aid the wash. It was as if she knew better than us what needed to happen, but just didn’t have the opposable thumbs to pull it off on her own. We sent a picture of the eye to our vet, but it was after office hours already, so that contact will need to happen this morning. We will get a professional opinion and watch her closely to see if it the wash cleared out an irritant or some other problem is still brewing. I’m sure glad about making that unplanned decision to wander down among horses. If I hadn’t, with darkness arriving at the hour earlier Central Standard Time, we wouldn’t have discovered how swollen it was until Cyndie showed up this morning to feed them. Don’t let this image fool you. Delilah is almost completely back to her old self. Tuesday, when I got home from work, Delilah was so full of energy that she wouldn’t leave Cyndie alone. After they came in from a walk, Delilah grabbed one of her squeaky toys and begged Cyndie to chase her around the house. When Cyndie laid down on the bed for a moment, Delilah started repeatedly hopping straight into the air for more attention. If she has any leftover pain, it wasn’t readily apparent. Last night I gave her a fraction of a walk, keeping the leash short so she would walk beside me, at my pace. She strained to speed me up the whole way. Every indication is that she is feeling just fine again. On the other hand, or I could say, hoof… Cayenne seems to have picked up where Delilah’s pain left off. That mare has suddenly become almost incapacitated over an apparent flare-up of laminitis in her front feet again, particularly the side that hadn’t previously been giving her as much trouble. It is heartbreaking to watch her struggle to move. I immediately isolated her from having access to grazing in the pastures, closing her into the smaller paddock. It seems like too little, too late, to completely turn the tide for this condition which is proving to be rather chronic for her. Cyndie said Cayenne didn’t show signs of a problem earlier in the day, so maybe by cutting off her grass-grazing right away, this flare-up can be calmed quickly. I fear it is all part of a trend for Cayenne that may be out of our control to alleviate. 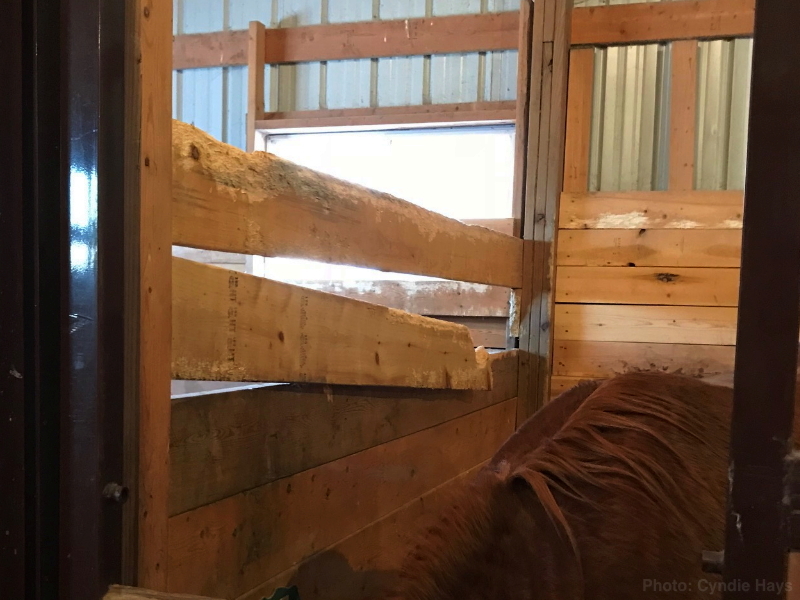 We’ve spent the summer watching George shape her hooves in increments to improve the orientation and provide her some relief, but it is a long, slow process because you can’t trim too much at a time. Now, just when we were hoping to have her beyond this problem, she is showing a turn for the worse. We’re very happy to have Delilah free of pain, but seeing an extreme discomfort move from one of our animals to another puts a damper on our urge to celebrate our dog’s improvement. 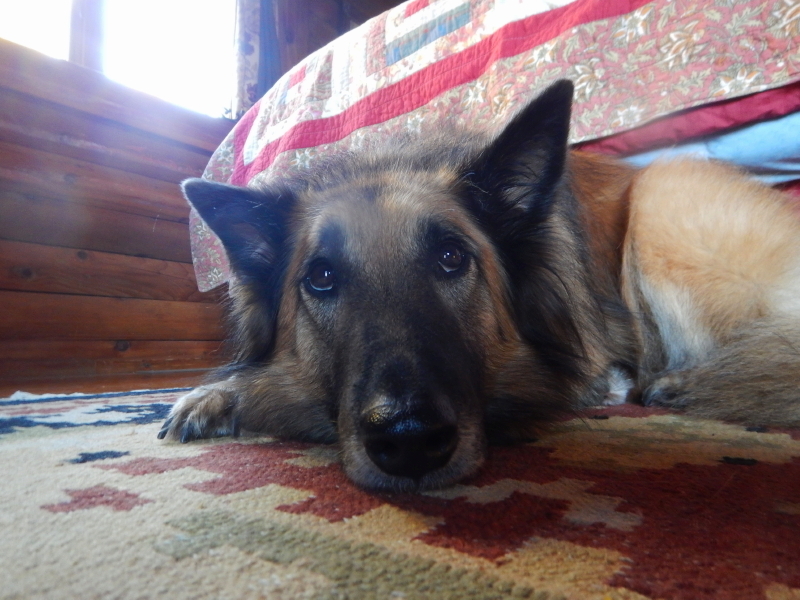 When our animals hurt, it tends to inflict a fair amount of sympathetic pain in us, too. One of the truest sayings is that the grass is always greener on the other side of the fence. For some reason the last couple of days for Cayenne, it had become downright irresistible. On Thursday evening, after we had walked the trash bin down to the end of the driveway with Delilah, Cyndie decided to open one of the paddock gates to the hay-field for the horses. They are well-familiar with the timing of being given access to the grass after the sun gets low, and calmly joined her as she neared the gate. I stood on the driveway with Delilah and watched as the horses stepped out. Cayenne immediately walked up to the arena web fence, almost as if she was going to go right through it, then stopped and leaned over in attempt to graze. I chuckled and commented over the obvious display of her interest. 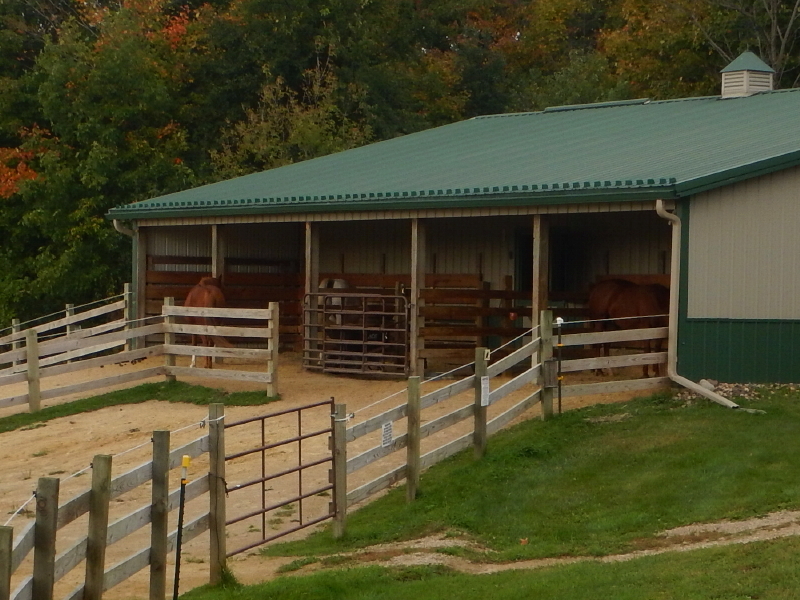 We know they like the short grass, and we keep the arena space closely cropped, but with the entire hay-field –now also cut short and open to their access– one would think they would be satisfied with the availability of the wide open acreage. 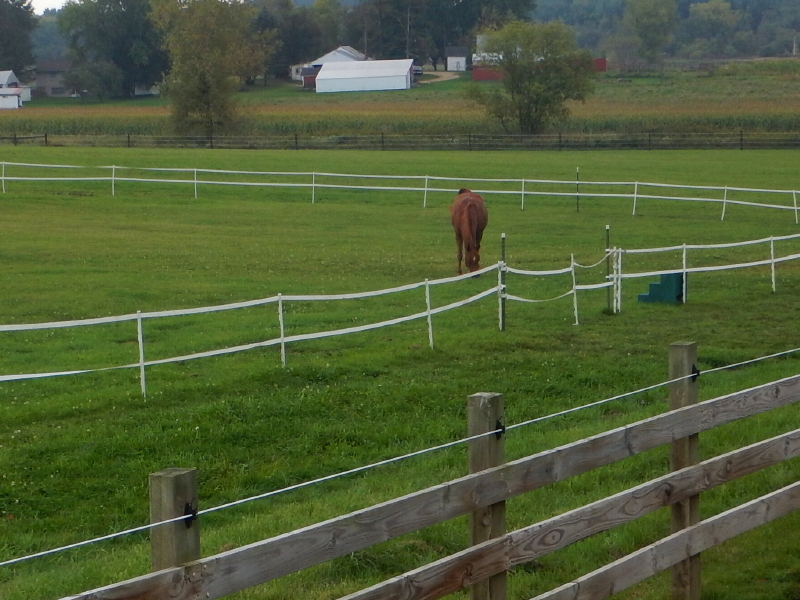 Regardless, Cayenne kept her focus on the arena grass. The other horses seemed satisfied with the grass right beneath their feet in the alleyway, but Cayenne moved along the web, continuing to seek access to the shortest grass. I saw trouble coming the instant she put her head between the two lines of web and warned Cyndie, who was already trying to get around the other horses to redirect Cayenne’s attention. Before Cyndie arrived to back her up, Cayenne managed to make a mess of things, bending a step-in post and popping the web off in a mini-panic to extricate herself. It was safest at this point to let her proceed forward, instead of getting her to back out. Of course, now the rest of the horses wanted in, so when Cyndie opened the access point to move Cayenne out, they all pushed in to join the fun. After some grumbly coercion, Cyndie got them all out and fixed up the fence. We thought that was that on the issue, …until yesterday morning. After breakfast, as we wandered down the driveway toward our first project of the day, we found Cayenne all by herself in the middle of the arena, looking guilty as hell while trying to project an aura of innocence. What was most shocking about it was that the web fence was perfectly intact and the access closed. Did she jump over to get in? Did she figure out how to step her four feet over without snagging the web? We have no idea. The mystery will go down as simply being Cayenne’s magic.